Multiple serendipitous twists led a 92-year-old Second World War veteran in Ottawa to find someone he was seeking for decades, thanks to Oak Bay High School students and some cards they left on a grave. While it was something as simple as a card that was ultimately responsible for the union, it took a fortunate series of actions for this connection to finally occur. A couple of years ago, two events key to this story took place. The Victoria School District archivist, Judy Stevenson, put together a catalogue of all the students in Victoria that had served and died in the First and Second world wars. Meanwhile, a woman by the name of Louise Barber dropped off some family albums and artifacts at the Oak Bay Archives. Barber thought the collection would be of more value to the community in the archives than in her personal possession up in the interior of B.C. where she now lives. Included in the collection was the life story of Roy Pattinson, her uncle by way of adoption. 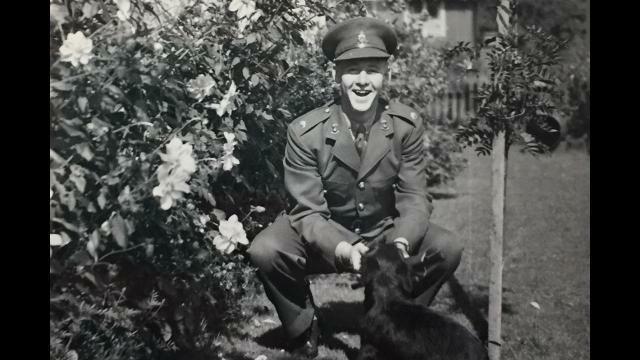 Roy Pattinson was born in Victoria in 1919 and grew up in Oak Bay with his sister and parents. His family was an integral part of the community, as his father, Robert Pattinson, was the local pharmacist. They built a pharmacy in 1936 on Oak Bay Avenue where the building still stands today, now housing the Penny Farthing Pub. Roy Pattinson attended Willows Elementary and Oak Bay High, and often played tin soldiers in Bowker Creek. Rattenbury Beach was his favorite place to hang out with his friends. Barber’s mother, Marjorie, who had been sent from Shuswap down to Victoria to finish high school, was adopted into the Pattinson family, becoming like a second sister to Roy. In 1937, when Roy Pattinson was 18, he joined the army. After years of training in Victoria, Halifax, and England, he went into battle with the Royal Canadian Artillery, landing on Juno Beach 12 days after the Allies launched Operation Overlord (nicknamed D-Day) in Normandy on June 6, 1944. While fighting on the outskirts of Caen, Lt. Roy Pattinson was killed on July 29, 1944, at just 24 years of age. “It was tough for everybody. The family never really got over it,” says Barber of her uncle’s death. The Pattinsons left Roy’s room just as he had left it, like a 1930’s time capsule right up until they sold the building in 1970. In the ‘70s, ‘80s, and into the ‘90s, Barber searched for anyone who might have known her uncle during the war that could share information about his death or the final months of his life. “For years and years I looked. I even advertised in the Legion Magazine for anyone that was in that Royal Canadian Artillery, the same unit as Roy. And nobody turned up,” says Barber. A few provinces away, just outside Ottawa, another fruitless search had been ongoing for years. Dr. Roly Armitage was looking for family members of a command post officer he had befriended while working as his technical assistant in an Artillery Regiment during training in England and on the battlefield in France during WWII. His friend had been killed right in front of him and Armitage felt that it was important to connect with the man’s family. With little information, his search always came up empty. All he had to go on was the officer’s name: Roy Pattinson. In all those years of searching after the war, the paths of Armitage and Barber had never crossed. This April, to commemorate the 100th Anniversary of the Battle of Vimy Ridge, Oak Bay High School teacher, Scott Alexander, and vice-principal at the time Jason Johnson, recruited 11 Oak Bay students to go on a trip to France. They were joined by 8,000 other kids from Canada who went to the ceremony at Vimy Ridge as part of an EF (Education First) tour. Alexander knew that he wanted to take the kids to see one of the Canadian war cemeteries and hoped to connect the war stories with the students’ lives at home in an effort to make the tour as impactful as possible. He looked at the planned itinerary of where they would be and saw that the closest cemetery would be the one at Bény-sur-Mer. With the aid of the catalogue that the Victoria School District Archivist Judy Stevenson had put together on the Victoria students who had served in the First and Second world wars, he knew that there were two Oak Bay High students laid to rest in that cemetery. One of those was Roy Pattinson. In advance of visiting the cemetery, Alexander had created laminated cards with an image of the original Oak Bay School. On the day of the visit, the kids wrote thank you letters on them for the two fallen soldiers from Oak Bay. There were tears from some of the kids, and silence, and somberness. The students really connected with the fact that the graves marked the loss of two men that went to the same school they went to, walked the same beach, played in the same neighbourhood. Shortly after the group returned to Canada, Scott Alexander received an email. Dr. Roly Armitage had visited Pattinson’s grave and found the cards. He wondered if the school had contact information for the Pattinson family. Alexander gave him the few details he had, which did not include a contact. From there, Dr.Roly Armitage sent a letter to Oak Bay municipal hall. His letter was brought down to Caroline Duncan, the archivist at the Oak Bay Archives. Duncan knew that she had an extensive Pattinson Family collection in the archives and a current phone number for Louise Barber, the closest living family member to Lt. Roy Pattinson, thanks to Barber’s recent donation to the archives. “Louise was absolutely delighted when I contacted her to let her know that Dr. Armitage had been in touch,” says Duncan. Duncan passed Armitage’s phone number along to Barber so that the two could finally connect. After a Canada-wide search that lasted for decades, Oak Bay High and the Oak Bay Archives were the conduits that finally allowed Louise Barber and Dr. Roly Armitage to connect. Fittingly, those serendipitous connections seem a nod to both the future and the past. “It is crazy to think that a simple gesture that we left, to try to show our appreciation, brought people closer together and it created this big entangled web of connections, from young high school students to a veteran in Ottawa to a grave site all the way in France. It’s mind-boggling,” says Gorman.